One of the top 5 most anticipated albums of the year is here! 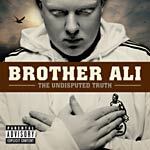 After officially joining Rhymesayers back in 2001, Brother Ali hit us with two very solid and very revealing releases. Just as personal and gripping as his previous releases, this album will become a mainstay in your collection. The decisions we make in our lifetime will affect us forever, both glory and guilt, and The Undisputed Truth isn't just one man's story, it's about connecting to people through music and hoping that the message is loud and clear. On the surface you get dope prodcution from Ant and lyrical mastery from Ali, but between the lines it's about how the personal struggle within us isn't over until we want it to be.